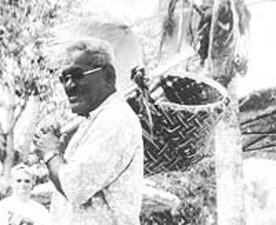 Uncle Jim, Fijian story teller. Tropical islands, for the most part, are much the same. Places where warm breezes caress swaying palms. Where tepid, multi-colored waters continuously lap deserted beaches, and travelers, weary of life’s frenetic pace, seek solitude under sultry skies. Certainly no exception to the rule, the islands of Fiji offer all of this and something more. For perhaps the truest wealth of this paradisaical destination is to be found in its friendly, caring people and their primitive way of life. Arrival in this far-away place is greeted with a smiling, ebony-faced, Fijian “Bula” (hello), accompanied by songs customary for welcoming strangers to the land. Then, for the rest of the stay, to pass someone or begin a conversation without a “Bula”, is considered rude. After settling in, a visit to a village is a must. Depending on size, each island is divided into one or more of these villages, each a self-contained unit with the land owned solely by native Fijians. Each tribal family is given a plot of land where crude cement block, tin and thatched roofed homes are built, semi-circled around an open space reserved for rituals, dances and the housing of a ceremonial hut. Most dwellings contain no glass windows, and doors stand open, never locked. There is said to be little or no crime in Fiji, with problems, disputes and violations settled by the tribal councils in each village. Dwellers there are classified in tribes; fishermen, craftsmen, farmers, etc. and the sons are designated to a tribe at birth, growing up knowing what they are destined to be. Land is handed from father to sons (never daughters) and families and extended families liveFire walking is a sacred ritual. together, younger generations taking care of the elder. There are no nursing homes in Fiji and when a woman marries a Fijian, she leaves her family and cleaves to his, going to live in his village with his family. 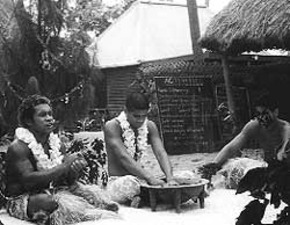 Fijian storyteller, “Uncle Jim,” contends that travelers must participate in a Kava ceremony to become a part of the islands. 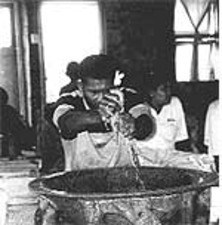 This intoxicating drink, gleaned from a native root, is first ground in a wooden bowl, dissolved in water, prayed over and offered to participants. It is first given to the Chief and tribal spokesmen, then to all others present. A cup is filled and presented, the receiver claps hands once, expresses a hearty “Bula” and drinks. Those present then clap three times approvingly echoing an exuberant “Bula” It is advised not to drink too much Kava as it may cause numbness of the mouth and feelings of drunkenness. Hangover to follow. As travelers leave these peaceful shores, serenaded by the traditional island farewell, they will have experienced firsthand an alternative to living “life in the fast lane”. Many will return to these islands for a respite, but a few adventuresome souls will return to live and work there. It is a choice and perhaps, for some, one well worth dreaming about.